Learn how Weight Maps define their area of influence upon a mesh. You can use vertex Weight Maps to modulate a variety of functions within Modo. When used for animated deformations (essential for character animation), you assign each joint a specific Weight Map that defines its area of influence upon the mesh. These Weight Maps are incredibly useful and tremendously powerful, but the drawback of a traditional embedded Weight Map is that it's part of the mesh and when the mesh isn't available, then the Weight Map isn't either. A weight container is the same thing as a traditional Weight Map in that it stores weight values for vertices, but it is separate from the mesh and is an item of its own. This is useful when rigging when you may want to abstract the weight values from the geometry. In this way, you can create a rig and attach it to the geometry. Then you can apply weight to the model and store the values in the container. The model is instantly affected by the rig. Additionally, because the weight container is its own item for storing values, it can store weights for more than a single item, which further streamlines the rigging process. 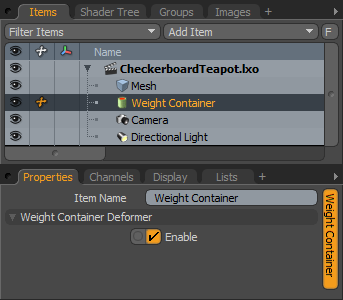 You can easily add weight containers to a scene by using the Add Items > Deformers > Weight Container command. Before you can create any weights, you need to link them to the target mesh(es). There are several commands that make these connections in the Setup and Animation interface tabs in the toolbox in the Deformers sub-tab. Adds a weight container to the Items list. If you select any items before choosing this command, Modo automatically adds them to the container. Additionally, if you have selected vertices, Modo automatically assigns a weight value of 1 to them. Adds any selected items to any selected weight container. Before clicking this button, select any number of items and a weight container. Additionally, if you select any vertices, Modo automatically assigns a weight value of 1 to them. Removes any selected items from any selected weight container. Before clicking this button, select any number of items and a weight container. Adds any selected vertices to any selected weight container and automatically assigns them a value of 1. Removes any selected vertices from any selected weight container. Before clicking this button, select any number of vertices and a weight container. Item Name: Displays the current item's name. Change the name by clicking the current name and typing the new name. Enable: Determines the effect that the container item has. When disabled, the layer has no influence on the scene. However, Modo saves disabled layers with the scene and its values are persistent across Modo sessions.